Republicans today are raising questions about the eligibility of Democrat state House candidate Lynn Brown McKinney. Pointing to tax liens filed against her by both the Internal Revenue Service and the Georgia Department of Revenue, Fulton County Republican Party Chairman Roger Bonds says Lynn Brown McKinney's candidacy may run afoul of the Georgia state Constitution. Bonds pointed to Article II, Section 2, paragraph three of the Constitution of the State of Georgia, which reads in part, "No person who [ . . . ] is a defaulter for any federal, state, county, municipal, or school system taxes required of such officeholder or candidate if such person has been finally adjudicated by a court of competent jurisdiction to owe those taxes, but such ineligibility may be removed at any time by full payment thereof, or by making payments to the tax authority pursuant to a payment plan, [ . . . ] shall be eligible to hold any office or appointment of honor or trust in this state." "According to court records, Ms. McKinney presently has over $43,000 in federal and state tax liens," Bonds said. "There is no evidence on record of her contesting these tax liens or putting into place a payment plan with the IRS and Georgia Department of Revenue." 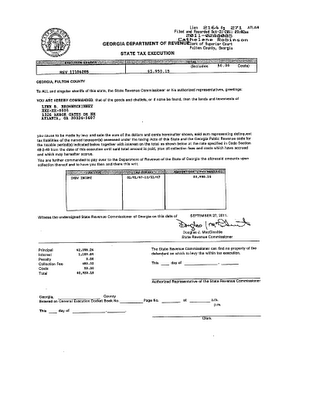 Georgia Politics Unfiltered has obtained a copy of the federal and tax liens filed against Lynn Brown McKinney in Fulton County Superior Court. These documents are pictured below. While Fulton County GOP Chair Roger Bonds stopped short of calling for Secretary of State Brian Kemp to challenge McKinney's qualifications, Bonds did challenge the Democratic Party to: 1.) 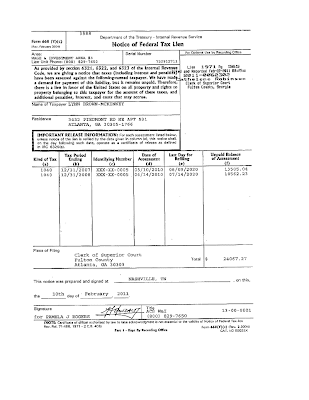 Demand that McKinney lay out immediately to the public any documentary evidence of payment plans for past due taxes with the IRS and the Georgia Department of Revenue; and 2.) Require that McKinney show through documentation whether she is current under any such plans. Lynn Brown McKinney is a candidate for the state House seat currently held by House Republican Whip Ed Lindsey.